Happy Monday! Wishing you all had a wonderful weekend whether you were out celebrating a religious holiday or maybe crying because your NCAA March Madness bracket was officially busted (no judgment here folks, I too cried). The first time I ever tried Booker’s, produced by Jim Beam, was on my first trip to Las Vegas, Nevada. At that time, the flight attendant asked if I have been to Vegas before and when I told him no, he very nicely handed me a mini bottle of Booker’s and told me to have a good time. I drank it, but I drank it with my coke so I never really truly got to taste the bourbon till last night. When thinking about what to write about today I wanted it to be whiskey or Bourbon because I had the Kentucky Wildcats going all the way (in both my brackets). Although they lost, they still had amazing run and that should still be celebrated. Booker’s was first established in 1992 by the grandson of Jim Beam, Booker Noe. Booker’s is the only bourbon that is bottled straight from the barrel. This means that it is uncut and unfiltered. It is aged about six to eight years and comes out at about 121 to 127 proof. Booker’s has a nice creamy start and then it punches you in the face. It’s intense even with a splash of water! If that is what you look for in a whiskey, then this is the perfect whiskey for you. I on the other hand was glad I only purchased a mini bottle because for me to enjoy, it would have to be severely water down or mixed with something else. It is a perfectly good whiskey that is complex and that many people love; however it’s just not the type of bourbon for me. I am glad to have tasted it but I wouldn’t go out and buy a bottle for my collection. It is a strong whiskey that will certainly add a few hairs to the chest. Ah the good old Bookers. So often the difference between clear and hazy memories of a night. 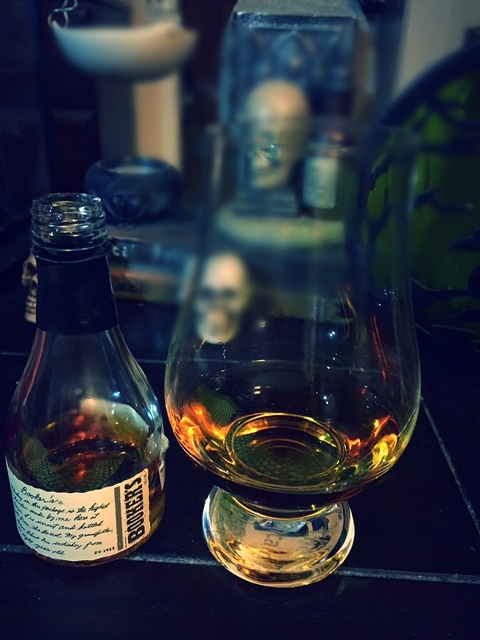 It certainly packs some punch… I loved it the first time I tried it – but experience has taught me to be wary… These days I actually find I prefer the 120 proof Knob Creek in the battle to the cask strength Kentucky’s.